« Senator Tom Harkin gives Commencement Address during Graduation day at M.U.M. Iowa Senator Tom Harkin Inspired M.U.M.’s Class of 2013 with his Top Ten Rules To Live By at the University’s largest graduating class. In true David Letterman-style, Iowa Senator Tom Harkin presented the M.U.M. Class of 2013 with his top-10 list—Harkin’s Top Ten Rules To Live By. Senator Harkin gave the Commencement Address after receiving an honorary doctorate from the University and inspired everyone with his humorous wit and down-to-earth wisdom. 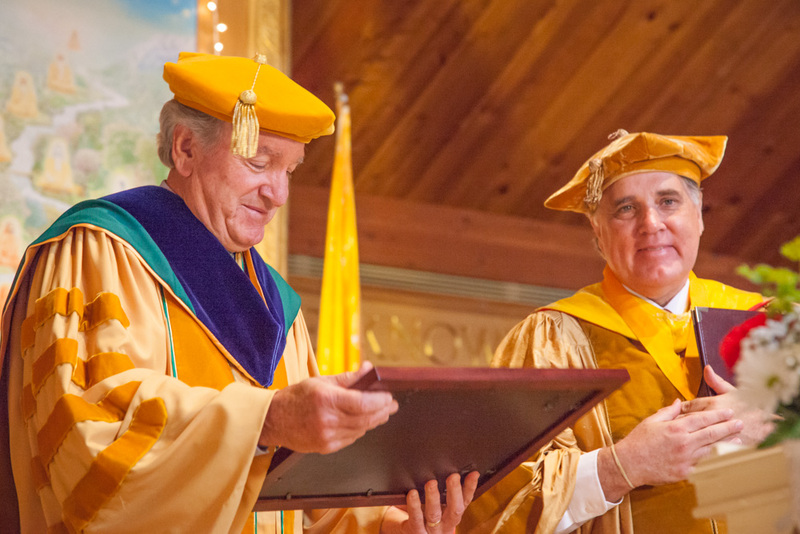 Iowa Senator Tom Harkin received an honorary Ph.D. from Maharishi University of Management before delivering the Commencement Address at the start of M.U.M.’s Graduation exercises, which took place last Saturday, May 25, 2013, in the Maharishi Patanjali Golden Dome of Pure Knowledge. The University’s 38th Commencement graduated its largest class ever of 334 students from 54 countries, out of the 88 represented on campus. The Class of 2013 included 251 graduates and 83 undergraduates. Check this link to see a menu of videos from M.U.M.’s Commencement 2013 http://www.mum.edu/commencement-2013. See the full PRWeb press release here bit.ly/17bxT6k for more details. Senator Harkin was awarded a Doctor of Laws Honoris Causa degree for his extraordinary lifelong service and compassionate and progressive leadership for the state of Iowa and the United States of America. He has served in the Senate since 1985 and also served in the House of Representatives from 1975–1985. He is chairman of the Senate Committee on Health, Education, Labor and Pensions and is the seventh most senior Senator overall. Senator Harkin began his commencement address on a humorous note. He thanked the University for this distinguished award and said, “I come before you with a measure of humility. I realize I was probably selected to be your speaker today because Oprah wasn’t available.” This elicited a lot of laughter as he was referring to Oprah’s visit to Fairfield last year, which she aired, including a profile of the Maharishi School on the M.U.M. campus. He was referring to Maharishi University’s unique system of Consciousness-Based education and leadership role in wellness research and sustainability. M.U.M. was designated as a Center for Natural Medicine and Prevention and has received over $25 million from the NCCAM and NHLBI over the past 20 years to conduct collaborative medical research on the use of Transcendental Meditation as a complementary alternative approach to treat hypertension and cardiovascular disease in underserved minority populations, the results of which have been published in top peer-reviewed scientific journals. Senator Harkin said he chose a method for the day’s occasion that has imparted wisdom to millions of people throughout the years—“I speak of course, not of the Ten Commandments, but of David Letterman’s top ten list.” But his were more like suggestions for students to choose, depending on which ones they liked. “You folks would agree with William Butler Yeats who said that education is not about filling up a bucket but lighting a fire. And you carry that one step further. At this university education is also about training, focusing, freeing the mind. It’s about raising consciousness. Here you have been beautifully prepared intellectually and spiritually for all the challenges you will face in the world out there, so you should go forth with confidence.” He encouraged students to move to smaller Iowa towns to make a contribution. 4. Express appreciation, and don’t hold back. He told each graduate to go up to that professor that made a difference and to thank them. He told them to thank their parents and asked them to turn to them and give them a round of applause. After thunderous applause Harkin came back to the mike to teach the enthusiastic crowd something. He told them that his brother was deaf, that he had learned sign language when he was growing up. He said there were a lot of wonderful signs in sign language and then demonstrated one of them. He raised his right hand and said it was made up of basically three letters. Lifting his pinky he said, “It’s ‘I’,” then his thumb and index finger, “the letter ‘l’,” his thumb and pinky, “and the letter ‘y’. And when you form those three, ‘I’, ‘l’ and ‘y’ in one thing, it spells out, in deaf language, ‘I love you.’” He smiled and said, “Thank you.” And the crowd joyously returned the sign and the loving sentiment. Salutatorian Melodía Morales, joined by her twin sister Coral, presented the class gift. Outstanding graduates and their special achievements were honored at the Awards Ceremony, the evening before Commencement. 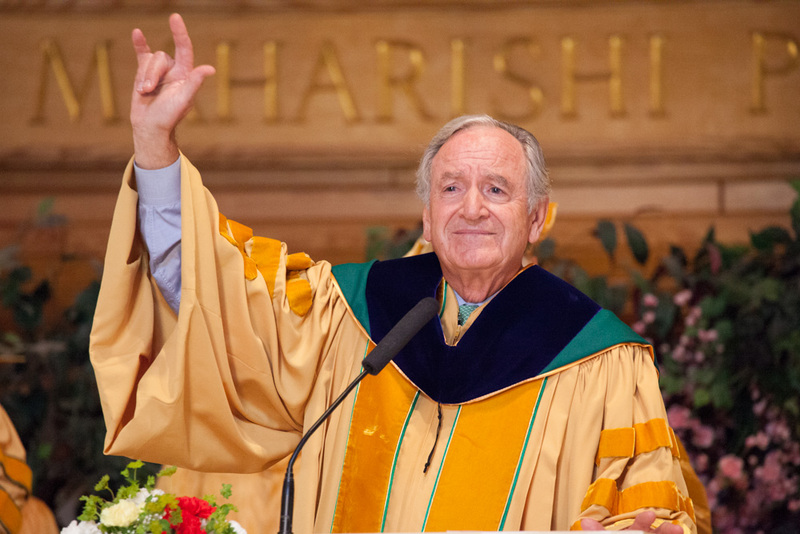 The full report with photos and links to videos also available on PRWeb: Iowa Senator Tom Harkin Inspired Maharishi University Graduates with his Top Ten Rules To Live By. The press release was distributed widely and picked up in major media outlets. It even made the Everything about Top Ten list in David Letterman: Top Ten and Late Show With David Letterman posted by rsspump.com. This news story was at the top of their Latest News list under the David Letterman name. Also see Iowa Senator Tom Harkin delivers M.U.M.’s commencement address—report by KTVO’s Laura Simon and Senator Tom Harkin gives Commencement Address during Graduation day at M.U.M. M.U.M. Achievements reported: Iowa Senator Tom Harkin Gives Commencement Address, Receives Honorary Doctoral Degree. This entry was posted on June 2, 2013 at 11:21 am and is filed under Articles, Education, Health, Maharishi University, Sustainable Living, Videos. You can follow any responses to this entry through the RSS 2.0 feed. You can leave a response, or trackback from your own site.